Full (exterior only) building and property grounds security, damage and maintenance inspections for residential properties. 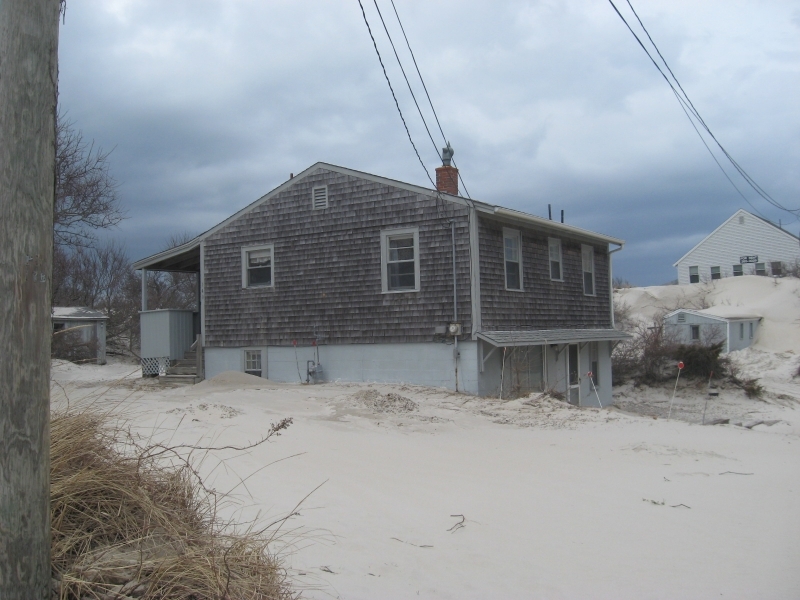 Designed for long term vacant residential properties and cottages where the owners are away for the off-season and need the exterior of the property periodically checked for security issues and storm damage (typically once a week or twice a month). Exterior Property Check services are deal for cottages, campers and winterized homes where mechanical systems and water have been shut down for the off-season. For higher frequency security patrols and property checks, please contact us. 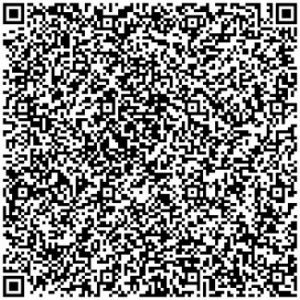 Security check and property inspection reports delivered instantly via email. All Cape Security Patrol is a security patrol company, so our reporting and records keeping is unmatched locally. All of our exterior property check patrol services include real time reports with GPS tracking, checklists and detailed images of the property delivered immediately to your email right from the property. Optional text message notifications can alert you that we were on the property and that a report has been sent to your email. Security patrol checks/property inspections are full EXTERIOR ONLY security and property condition inspections. This includes the property access, the grounds and the exteriors of all buildings on the property. Patrol agents will also attempt to visually inspect the interiors of buildings on the property from the outside where possible. 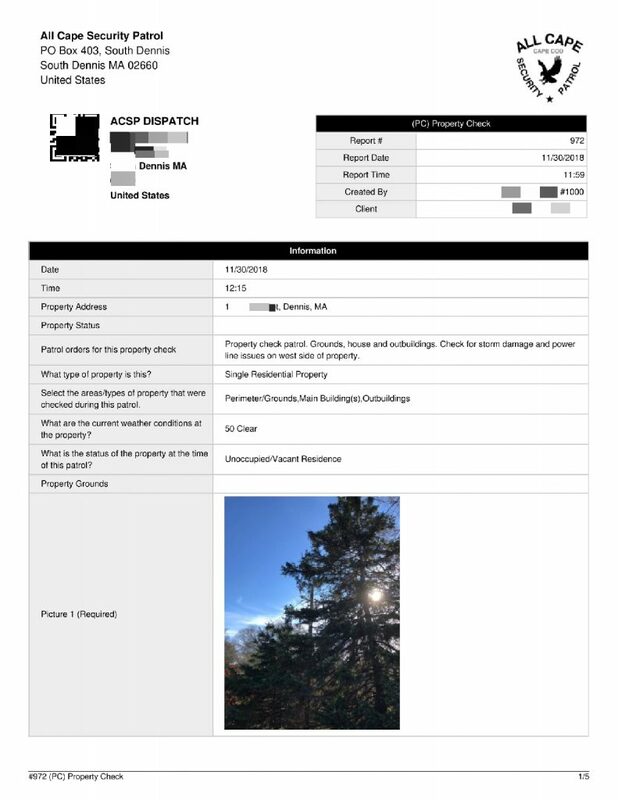 Each regularly scheduled property patrol check includes a full patrol property check report delivered via email. All patrol checks and routes are logged via GPS tracking and each property check report includes GPS position and images taken at the property during the patrol for verification of services rendered. ** Price below is per regularly scheduled patrol check (property patrol and email report). Select the total number of patrol checks you want conducted over the time period you are away. For On Demand/Emergency property check services, please call us at 774-383-2030 anytime 24/7, or click here for details. Patrol checks are conducted at regular intervals throughout the length of the patrol term based on the number of days/weeks/months you are away and how many patrol checks you order. Patrol checks are conducted at random times of day and routes/days are switched to avoid patterns and increase the visibility of patrols in the area. There may be times when you want a patrol check done on a certain day or time, like maybe a package is to arrive, or when a contractor is supposed to be finished with work at the property, etc… In that case, notify us and we may be able to reschedule a patrol check to accommodate your needs. 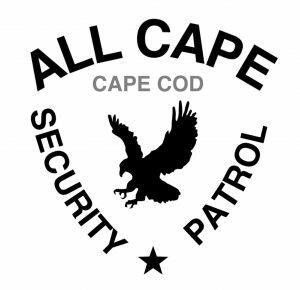 All Cape Security Patrol proudly serves the towns of Barnstable, Hyannis, Brewster, Bourne, Chatham, Dennis, Eastham, Falmouth, Harwich, Mashpee, Orleans, Provincetown, Sandwich, Truro, Wellfleet and Yarmouth. 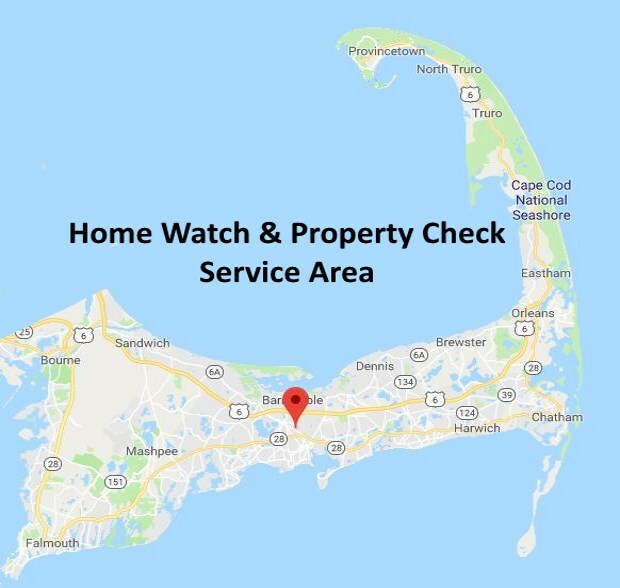 Online ordering of long term off season property watch security patrols and residential property checks is currently available for properties anywhere on Cape Cod. For details on long term residential winter watch security patrol services, please call (774) 383-2030 or email us. Select how many patrol checks you want conducted while you are away. Winter watch property patrols are typically done once or twice a week. For higher frequency property patrols and rates for multiple properties in the same immediate area or neighborhood, please contact us.